Triumph is a clean and elegant news and business theme for WordPress. With cool colors and sleek lines, Triumph will wow your readers and potential clients. A premium WordPress theme in a class of its own. 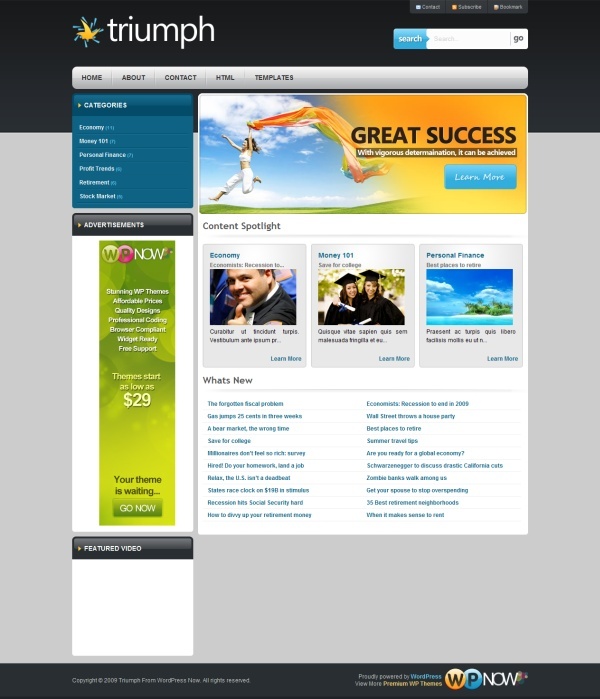 The Triumph theme is WP 3.0 Ready, Supports 3.0’s Custom Menus, offers Intuitive Theme Options Panel, comes with Easy-to-Use Built-In Ad Location, has 3 Homepage Featured Sections, as well as a Custom Styled Breadcrumb Navigation. The theme is Widget Ready, Adsense Ready, offers Menu & Submenu ‘Show’/’Don’t Show’ Customization, has a “No Sidebars” Template, a “Links & Bookmark” Template, and a “Sitemap” Template, supports Threaded Comments, and comes with Five Level Dropdown Menus. Coda is an elegant and feature-rich magazine template with a neat home page js scroller, and an otherwise completely widget based home page design. With a custom styled Twitter module, a “Share this” module and a “Like this” popularity-based post feature this theme will surely woo you. 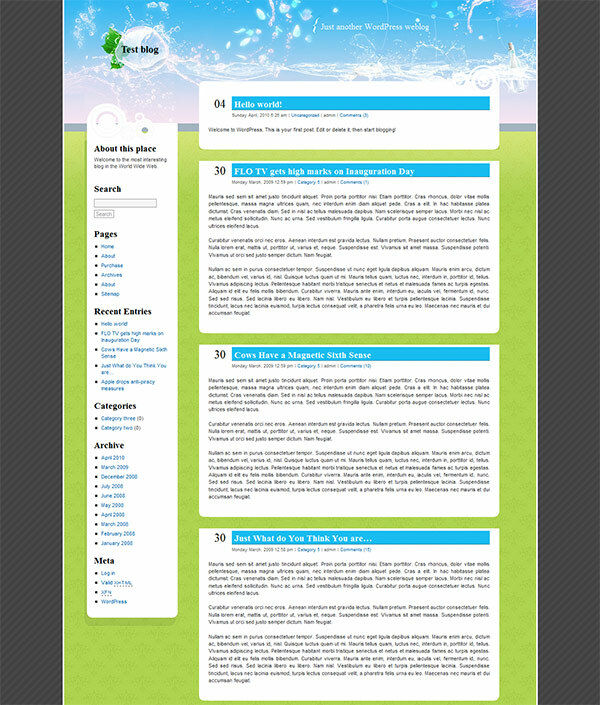 A custom home page featured area to showcase specific posts, all powered by jQuery. 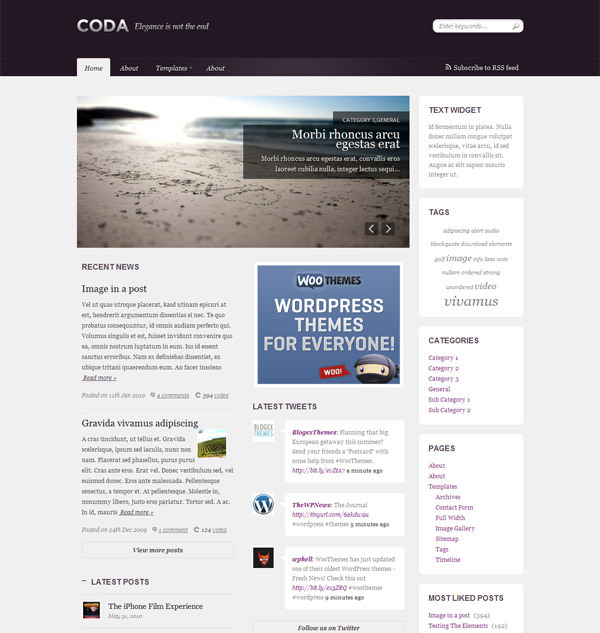 The Coda home page is completely widget based with loads of great custom widgets for placement. A beautiful archive template visualized according to dates. There is also a Tag Archives template unique to this theme. Custom Woo Widgets for use in the sidebar and in the widgetized footer: Flickr, Ads, Twitter, Featured Media and Latest/Popular Post accordion. You also get 10 beautiful, alternate styles to choose from and options to set your own background color or upload a background image.